The being known as Balder is the son of Odin and his wife Frigg. Technically, this makes him both Vanir and Aesir, though Balder did not know of his parentage until he was much older. Balder was raised with his Half-Brother, Thor, and adoptive brother, Loki as the youngest of the three, but as a friend, not as a Prince of the Blood. He grew up in the palace, and accompanied the elder two boys on their adventures, but always was he considered their inferior and lesser. At a very young age, Balder learned to fight and brawl right alongside Loki and Thor, and was only a little behind his erstwhile brother, Thor, in strength of arms. Balder and Thor, while they loved each other as brothers, were always competitive. There were few other than Balder who could best the mighty Thor in grand melee spectacles. On one such occasion, Balder earned the epitaph "Balder the Brave". It was that honor that began to gnaw at the envy within Loki's heart. As a youth, he spent time, off and on, with a youthful Karnilla the future Queen of the Norns. There was a mutual attraction, but her tendency to cruelty and her thirst for power split them apart. She would remain fixated on the price who got away. When he was a grown man, Balder began to have nightmares about his death. He soldiered through them, but the strain began to show. Taken before Odin by Thor, and commanded to speak true, Balder did. He prophesied Ragnarock would occur after his death. Odin and Frigga revealed the subterfuge at this time, and Frigga cast a great and grand spell that would protect Balder from all harm save that from mistletoe. Although Balder did not know it, it was then that his fate was sealed and the bitter seeds of envy were sown with his erstwhile brother, Loki. Despite the gifts, Balder would spend the rest of his lives(s) plagued by an existential dread and melancholy. He filled this doubt and fear with Adventure. He would keep the chaste company of Sif, as she could trust her beloved's brother. He also adventured with the warrior's three and other Asgardian heroes. He was a stalwart for good, and a powerful one, often serving as Thor's second, and a chief lieutenant and sometimes regent for his father, Odin. After further adventures that spanned if not centuries, then millennia, Balder was slain by his alleged cousin at the behest of Loki. Make no bones about it, Loki is the one who had Balder killed. It took a lot of the affection out of the two adoptive brothers. Loki has taken advantage of Balder's self-sacrificing and fundamentally decent and trusting nature throughout their relationship. Balder was rescued by none other than Thor, with assistance from Hermod and Sif. He rejoined his family in Asgard. For a time, though, he was regent of Hel. When he came back he was haunted; so horrible were the terrors he had witnessed that his hair had turned white. He forswore violence and ate his feelings. He had a lot of feelings, and quickly grew to a size to rival Volstagg the Voluminous. He became ashamed, and more tormented, so the uncertain Balder went out into the desert to die. The kindness he experienced amongst the downtrodden there changed him. He finally snapped when agents of Karnilla were found extorting the poverty stricken desert dwellers. He slew out a few of them, and after demanding the villagers be left alone, and being granted it by a chiding Karnilla, Balder went home. Only Thor understood him when Balder explained everything to him. It was Thor who spoke of the man of principle his brother was, and how a warrior could become something even greater should he keep to his principles. He could be a hero. Balder put down the fork that very evening, and he worked himself into better shape than he had been in before, and he forged himself into a warrior of righteousness. Asgard and Thor rejoiced, for thought Thor was busy on Midgard, Balder the Brave was hero enough for Asgard. Even as a man of principle and a hero of renown, Balder suffered from self-doubt, torment, and dread at the prospect of his death and the repercussions it would have throughout the Nine Realms. Now and then, he would tarry with a tavern girl, but it never lasted, until one day a beautiful blond woman dropped an apple from her basket in front of him at a market. He helped her, they flirted, and it bloomed into romance. Her name was Nanna, and Balder the brave was bold in love as well as battle. They courted and consummated their love, and had it blessed by Odin himself. Asgard seemed to bloom at the young love as the two were wed.
Hel then came to claim Balder's soul. Some say it was jealousy, or she was betrayed in her payment, or others yet blame Loki and his machinations and petty jealousies. Regardless, Hel was owed a soul, and she would have it. Thor offered his, but it was forbade by Balder and Odin as well. None would suffer for Balder. None by Nanna who stalled Balder and fell upon Hel's killing hands, freely offering her soul up in exchange even as she swore her eternal love to a grief-stricken Balder. Hel took her soul back to Hel. She would not bargain for a soul freely given, for they are rare things. Balder grieved. While he has recovered, he will not and cannot talk about Nanna. He will feign ignorance. He will retreat from conversation, or if in battle viciously and decisively strike. To speak of her is forbidden in his presence. Even the All-Father, Odin, does not goad his youngest son with her name. Even Odin, a conniving schemer if ever there was one, knows that scruple and loves his son that much. Some time later, as what is time in Asgard, Karnilla came back into Balder's life. She tempted him with kisses and power. She placed herself in danger to lure Balder from his father on several occasions. She made him swear to her to abandon his father to aid and obey only her. Balder denied her the oath, but said that when he could, aye, he would be her man and do what he could to serve her. Blood, duty, and honor were stronger ties than words. She wanted him, and would have him. He wanted her, but would not take her. Finally, he came to know her for what she was; complicated. Though she was a villain, she was also an ally. Slowly, she learned to be more of an ally, and she won his heart. She was always hot, and then cold to her beloved. When he displeased her, she would deny him love and affection, which he would drolly note. When he she did approve of his deeds, she was most effusive with her affection, and Karnilla was a comely, healthy, willful woman who knew well what she could do. Karnilla overplayed her hand, and her people suffered a brief subjugation and reign of terror from Utgard-Loki (no relation) and his Frost Giants. Balder broke off from helping Thor on Midgard with his brother's permission and rode to the queen's aid. After slaying many giant's, Balder was pressed to a high point by others, and left with little choice. He revealed his often hidden power, and declared to all he was, indeed, the god of Light and unleashed wave after wave of solar light and heat into the frozen valley that held Utgard-Loki's castle. The heat and light reduced the giant's to the size of house cats, melted the castle, and won a chained, shackled, gagged, and hair-shorn Karnilla's freedom. He showed the giants mercy, as they were no longer a threat. For that, Karnilla spurned him, despite having moments before declaring herself his. She sent him back off to help his brother with her blessing, and in truth her heart, declaring "go lest I forget I am queen, and not merely a woman". She had taunted him before to return upon his shield, or not at all, for he would no longer know her love. He had many more adventures before deciding it was time to return to Karnilla, and to finally just solve their issues, to wed her, and to make her Asgard's ally. He was thwarted, and she never saw him again in that life. He returned on his shield, betrayed and slain once more by his adoptive brother, Loki. Karnilla's rampage was halted only when the silver horns of Asgard warned of attack, and the rooster of doom warned of the unmaking of the world. Ragnarok. Balder was of no use during Ragnarock, as Hel would not release his soul. It is not his story to tell, as he did not truly battle in it. Odin and Thor concocted some plan, and put it into motion breaking the cycle. All the Asgardians died. Karnilla and her norns were spared, or so it is believed. All Balder knows is he has not seen her again, and he woke up on Midgaard, trapped within the Destroyer armor. Thor woke him from his slumber, freed him from the armor and made Balder regent as Odin and Surtur the fire demon were locked in eternal conflict. Thus it was that Balder and a reborn, and this time womanly, Loki ruled the Asgardians. She advised her brother and Lord. At first her council was fair and just. It soured over time, and became dark and twisted. Loki brought forth Thor and Balder's uncle Bor, and used her magics to disguise him and madden him. Thor sklew him. Bor was, at that time, the rightful king. Loki took great relish in Balder banishing Thor. Balder becoming King increased his standing, power, prestige, and put him on the council of god-heads. Balder was made king of the remnant of Asgard floating over Broxton Oklahoma. Loki advised him, and it was Loki that dripped poison into his ear. It was Loki that misguided and confused Balder. It was Loki that made the new and burgeoning King into first her, and then Doom's fool. Though Balder sat on the Council of Godheads, it was Loki who generally pulled the strings, though Balder did manage now and then to rule properly, justly, and held a sword to Loki's throat on more than one occasion. But, Loki did not always speak false. Balder's spell no longer protected him on Earth. Only in lost Asgard would it defend Balder the Brave. Balder relished it, as it allowed him to prove his mettle. Victor von Doom allowed the Asgardians to dwell within the confines of Latveria. All of them, were deceived, as he forged, constructed and powered his own Destroyer from the souls and bodies of reborn Asgardians, harvesting the spark of the Odinforce that granted them their vitality and longevity. The Asgardians fought and with the aid of heroes freed themselves. Balder himself fought a personal battle, slaying mutated, deformed Asgardians and restoring the life of Kelda, a woman of beauty, grace and wisdom that might very well have been his Nanna. He does not speak of her, but he will speak of Bill, the mortal man who loved her, and his love and sacrifice for her. Bill died in Balder's presence, wishing only that Kelda would live. It impacted Balder greatly, and the memory of her loss would at times paralyze him into inaction. When Balder and his people returned to Oklahoma, they immediately fell victim to the civil war amongst the heroes of Earth. Norman Osborne besieged Asgard, and began to win, as the Asgardians were weaker in this time, and were already weary from the battles in Latveria. Heroes again came to their aid. In these dark times, Balder the Brave earned his title time and time again, though he could not carry the day unaided. Osborne too had been manipulated by Loki, who was going to rule as Queen. Osborn unleashed the Sentry upon Asgard, to destroy it. This was too far, and Loki sacrificed herself to enable others to halt the Sentry, and re-embodies Odin. Tyr, a forgotten son of Odin, and Balder both battle bravely to defend their home. All of Asgard swore itself to aid midgaard as Midgaard had helped it. Tony Stark rebuilt the lands of it, and rechristened it 'Asgardia'. Odin rebuked his sons, and went into exile in the remnants of Asgard. Balder kept his newfound strength, with Odin not denying his bravery, only his naivete. He replaced Balder with a council of All-Mothers, and charged his sons to defend Asgard and their Queens. They did so. It cost Balder his life, which he gladly gave in the service of his mother and father when the World-Eaters would later threaten all of the Nine (now Ten) realms. Balder himself killed the World Eater prince, before falling to his death. His vengeful spirit met the defeated world eaters in the limbo of the World Tree and did great torment to them. It took Balder a moment. He thought about pledging himself to his father's service once more, or finding Karnilla. As Odin berated him, calling him worthless and Thor unworthy, Balder stood straight, and declared that he would be his own man, and walk his own path, as he was so incapable of doing his father's bidding. This only further enraged Odin, who spoke words of hurt and heaped injury onto his newly reborn son. Balder weathered the storm, and gathered arms and armor. He ate two of Idunn's apples, knowing it might be sometime before he returned to Asgard. Some funds were taken for his use, though he has access to accounts he set up as King. He can live well, though honor compels him to be frugal as he can. He spoke to Heimdall, and made for Earth. He has promises to keep. He does not know that he is doing what the All-Father wishes of him, nor does he care. Sick of compromise and the burdens of leadership, Balder walks forth to do good and right upon the Earth. He was king of Asgard when Asgard swore to defend the Earth. This is an oath he means to keep. Balder means to do right. When Asgard needed help, Earth's heroes came to Asgard's aid. All of Asgard swore to come to Earth's aid, should it ask. Balder was the King at the time, and he means to do right by that oath. Balder's first goal is to help defend Midgard. As he is learning more about what has been going on, Balder will feel compelled to help out this new Thor, and to help his older brother, the previous Thor, maybe get resituated. In the meantime, he will also look after the few Asgardians who remained on Earth, and look for Loki. These are all symptoms of a bigger issue. Of all beings, Balder is looking for redemption. He wants to make right what went wrong. Balder got lost in the moral compromise and politics of leadership. He allowed himself to be led astray by his brother/sister Loki, and to be convinced that doing nothing was the best course of action. He will not make those mistakes again. Balder relishes this opportunity to do what he enjoyed; adventure. Balder has simple goals. he wants to make a difference. If by his life or death he can make the world a better place, he will do so. He has other goals. There is something going on regarding Mjolnir that someone should poke in on. He would like to kill Doctor Doom and see to it the villain was imprisoned in hell. Loki he is more torn over, and if he had his druthers, he would redeem his brother/sister/whatever and use Loki's knowledge and expertise for the betterment of all. Finding Karnilla has a certain appeal, but he doubts he could be her servant, and he is not certain he has what it takes to be a king. Meeting someone who actually cared for him would be pretty damn glorious, and might make a few old wounds vanish. People love him. Balder brightens up the darkness. He is light incarnate and all sorts of people are drawn to him in no small part due to that. He can stir the hearts and minds of soldiers. He can lead warbands into battle and they will willingly die for him. Balder can make friends where ever he goes. He is charming, and has a certain dry, gently acerbic wit and a warm self-deprecation that many people respond to very favorably. Balder has been knocked down, and knocked down hard. He always manages to get back up. He recovers from death, and torment. He recovered from loss and torture. He nearly ate himself to death, then went out to kill himself through horrible starvation and only came back from that stronger than ever. At his core, Baldur, for all that he seems fated to die, is a survivor. He may suffer and wallow, but he always picks himself back up and gets back to work. Fundamentally decent, good, and honest, Balder is a 'man' of integrity. His oath given is an oath kept. He is kind and gracious to women and children. He is brave, clean, true, and compassionate. He is hardly perfect, but his lapses and imperfections are most often a result of failing to be true to himself or falling victim to one of his tremendous melancholies. Tyr is in Asgard. Karnilla has yet to reappear. Nanna has been dead for lifetimes; some days he almost forgets what she looked or sounded like, and it makes him want to cry. His brother 'Thor' is no longer Thor; Thos is some very comely woman in a helmet. His brother now goes by Odinson, or some other nonsense; no one seems to know where he is. Loki used Balder, again, and is now either dead or once again his old evil self. His mother is in Asgard, and Odin berated him when last he spoke. Shy of running into Brunhilde or maybe Jane Foster, Balder is very much alone in the world. A couple of good friends would do him good, and it is unlikely they would ever have as true a friend as Balder the Brave. She might be a tavern girl, or a kind blond, or a powerful warrior and enchantress, but Balder does not care. He lives big. He loves big. He mourns big. He is a romantic at heart, and has admitted to his brother Thor (When Thor was his brother- now known as Odinson) that he envied Thor's relationships with Sif and Jane Foster. Balder did not get the chance to do it right with Nanna, and Karnilla was always complicated. Balder has always been at his best when he is anchored to someone. That said, he has never had a truly wonderful romance, and while he yearns for someone to share his burdens, he believes it is not going to happen. It should be noted that Balder comes from a society where slavery is legal, there is a bloodprice for murder, and where executions, banishment, and other extreme punishments are run of the mill. Killing a man means little to Balder. That being said, there is a just death, and an unjust death. Balder has killed Frost Giants, and he has allowed others to live. He takes into account the sum totality of the circumstances, anf applies his best judgment. That being said, if attacked, he will respond with lethal force unless reminded to not be too violent. While his morality is complicated; the idea that there should be some basic fairness is not lost on him. Nor is the idea that there should be fair and equitable law enforcement. Balder is beginning to appreciate that laws mean less than justice. He has seen how evil doers misuses the law, and has been on both sides of that situation. He has an innate sense of justice though. Not as gentle a justice as is common today, but he was very progressive for an Asgardian. He judges people by their actions, not the color of their skin. He is about the most even-handed Asgardian there is. Though not as naïve as he was once upon a time, Balder is still naïve. It is part of his character, and the downside to being as even-handed as he is. Trying to give everyone a fair shake means that Balder believes everyone is fundamentally good. He has experienced petty jealousy that has resulted in his own death. He has seen such horror that his hair went as white as a sheet. He still wants to believe in people. Balder has died for causes. He has seen hel. He has resisted offers to bring back dead lovers at the cost of the lives of foes. Balder forgave his own murderers and begged for their pardon. He is a being of both principle and integrity. He has experienced horrors that turned his hair white, no mean feat for a god. He remains sane. This speaks to a tremendous amount of will. Balder is smarter than most, but by no means a genius. He would be considered bright by most. However, his education and training are limited by what Asgard has to offer, and he is trained as a warrior. He is an adventurer, prince, warrior and traveler. He is not a sorcerer. He is not dumb. He just does not see the world the same way as moist people. Life is a challenge to live, experience, and triumph in. The Asgardians are an extra-dimensional race of beings. Balder is one of the most physically powerful of his kind, though when compared to some of the others, he pales in significance. Balder is, however; one of the most all around athletic of the gods.r Strength: Balder was a king, and as such, he gained amazing levels of strength. Balder can comfortably lift and heft 50 tons of weight, making him very strong. He is nearly twice as strong as the average Asgardian god. Stamina: Due to their alien nature and other factors, Asgardians produce fatigue toxins at a dramatically reduced rate compared to humans. Balder can go all day, and all night without fatigue taking a toll. After 24 hours of nonstop activity, even Balder the Brave begins to be taxed. Dense Tissue: Skin, muscle, and bone density of Asgardians is about three times that of human beings, giving their frames the ability to handle the formidable forces of their bodies. That being said, the typical asgardian male finds water quite difficult to float in. Their strength enables swimming, but floating can be difficult. Durability: Asgardians can survive falls from great heights, and pressure and temperature extremes that would kill a human, and great amounts of force to their frames without damage. Balder can dish out more than he can take, generally. His own physiology is proof against antipersonnel weaponry, flame throwers, and light anti-vehicle attacks (Machine guns, light missiles, grenades, mines). Beyond that, and Balder is getting hurt. Regeneration: Unless cause by mistletoe, Balder can survive having his heart removed and remain conscious and fighting for five minutes. If during that five minutes, he can get his heart sort of in the right spot, well his body will do the rest. Doctor Doom plumbed the depths of Asgardian physiology with cruel vivisections. Longevity: Without periodically eating one of Idunn's golden apples (An apple a decade keeps the grim reaper away) Asgardians will age and die. They live for several millennia without Idunn's apples. Baldur's current body is that of a young, but physically mature adult, roughly equivalent to a 22 year old male. He ate two apples before he left. Frigga made him. Immunity: All asgardians are immune to all known diseases and infections. But not to poisons or toxins. They can get drunk. They need air to breath, as well as food and water to live. Though Balder has a tremendously efficient metabolism, he requires far more calories on the average day than a human would. If he is fighting, and recovering from injuries, even more calories are needed- that is why Asgardians feast. Balder can hold his breath for five minutes. He can be comfortable in heavy furs in Death Valley, and he can frolic naked on the Russian Taiga without suffering from exposure. He would prefer not, but he can. Superior Speed: A heavily armored Asgardian warrior runs about as fast as Usain bolt without fatiguing for a day. Balder is far faster than the average asgardian. Thor once remarked he moved at the speed of light. This is a gross exaggeration. Balder can only run at about 60 miles per hour; he is one of the faster asgardians. In Balder's case, though, he is not just fast, but also quick. He moves and reacts to stimuli at a greater speed than almost all Asgardians. His attacks are fast, his feints and dodges are faster. Balder is not only far stronger than the average asgardian, he is far faster. This rare combination is part of his prowess as a warrior. While on Asgard, Balder cannot be killed. He is completely invulnerable to harm. He may be poisoned, and he may get drunk, or die of exposure, thirst, starvation, poison, or any number of horrible things, but he cannot be killed. Strike him from Orbit with an asteroid and he will crawl out from under it, hair barely mussed. Mjolnir cannot kill him. Lightning makes his hair stick out. Flames do not char him. However a weapon made of mistletoe, a normally weak, soft, supple wood will by pass all of his invulnerability, even his normal asgardian physiology. If It pierces a vital organ, Balder will die. Balder likes to think of himself as a hero. Shooting God rays of energy is not his normal form of attack. However, Balder is the Asgardian god of Light. He can generate enough light and heat to reduce a vast Frost Giant fortification and its vast garrison. The Castle of Utgard-Loki was demolished, and he melted the giants of the garrison to the size of housecats over the course of just a few moments. That is the absolute high end of his powers; he was rescuing his lady lave from a hive of villainy and he was being overrun. On a routine basis, Balder can generate a beam or bolt of light equal to the force he would get from punching it (Equivalent to approximately 50 tons). He can hit anything inside his line of sight. As he is a god, this is a holy type of light and would almost certainly be lethal to all but the most powerful of vampires, and even then, it might be enough to kill even them, particularly over an extended period. In theory, this ability should allow Balder to do numerous tricks. In practice, he has only recently taken to using it on a regular basis, and it is more or less used as a potent ranged attack. Over time with effort, training, and practice he could certainly develop flashes and maybe other more esoteric things. This is highly unlikely, as give Balder a hammer, and he'll make a sword out of it. Balder is an Asgardian God. He has many objects and tools to accompany and aid him. He was the king of Asgard, at one point, and is happily simply just a prince of the blood, and not even the favored one at the moment. Despite that, Odin did not banish Balder, and thus Balder has access to many of the tools of his trade; and Balder the Brave is a warrior born. Swords: Balder has more swords than he can wield. He has numerous one and two handed swords capable of surviving the incredible clash of combat between gods. While they are not unbreakable, they are capable of handling impacts with Mjolnir a couple of times before breaking. Asgardian Armor: Forged of mystical steel, bronze, copper, gold, and auroch leather and crafted by the finest asgardian armorsmiths, Balder has several suits of armor of beautiful, yet functional asgardian battrle armor. He brought three of them to Earth with him. Balder's armor id built to provide protection in the dimension of Asgard. Asgard battles are brutal even by human standards do to the amazing levels of strength asgardian warriors have. As a general rule, each suit is enough to protect Balder from artillery grade weaponry. (A typical Asgardian warrior can lift about 30 tons). It offers no protection from radiation, biological, or poison attacks. It can only protect what it covers, and even then, a capable warrior can work around armor. Balder brought two of his plainer suits, and one of his fancier suits. He has helms, gloves, boots, and surcoats as well as winter wear for his armor. Unlike Thor, he has to actually put his armor on, though as he does not have a secret ID like Thor, this is also less of an issue than one might think. Long ago, Odin had a golden hilted sword forged with a blade fired from meteoric iron that fell to the ground in Asgard. This sword was specially made. Long, perfect, and deadly it never dulls and it is impervious to breakage by almost any means. This sword he gave to Balder. It is no match for Mjolnir, but Balder's sword had other gifts. This sword has a variety of properties. If it has a name (and it does) it is not usually used. It is usually called Balder's sword. Balder and Odin know the sword's name. (Sword name is Player created content; Aurvandil - Norse for Morning Star). Dimensional travel: With a flourish, Balder can transport himself and no more than 3 other individuals to and from Asgard. He can make the trip there and back again only once a day. Summoning: Balder can summon his blade across dimensions and through space time to him. Is his sword, and when he calls for it, it will come to him. It may take a moment or two for the sword to appear, it always does, and never a moment too soon. Light Channeling: This blade is named as it is because with it Balder can safely channel his Holy Light. The blade can withstand the tremendous amount of energy that Balder can theoretically generate. Durability: This sword is not the magical equal to Mjolnir, it is able to survive combat with Mjolnir unharmed. Balder most often wields two swords at once. He is masterful with his blades. He is equally, and tremendously adroit with either hand, or both hands at once. Balder can speak and understand any alien, human, demon, angelic, or other sentient language that is spoken. There is understanding and high fidelity information exchange. Allspeak still allows for lies and subterfuge, but at the very least it allows for communication with anyone at any time, no matter than language. He is 6'4" and built like a warrior god of awesome. Balder has an appealing physique, and his features are regarded very highly by Asgardians of both genders. He is symmetrical featured, and his frame is muscular and powerful without being muscle-bound. While cultures vary on what they value, Balder usually is at least acceptable. Balder makes pastels look manly. Balder has connections to numerous powerful entities. While he may not necessarily call on them for aid, he is one of the beings on the planet who can very easily disseminate information. Also, if Karnilla the Norn Queen lives, she certainly has an eye on Balder. Particularly with him out of favor with his father. God Heads Council: Balder served on this council when he was King of Asgard. He had a different, and appreciated perspective. He got along best with Athena. He is no longer a member, but if he needed to get in contact with a member of the council, he still knows how. Avengers: His brother was a member. He has adventured with them, and they aided Asgard when Asgard was under attack. Balder is more inclined to aid the Avengers than call on them for aid, but he is able to contact them, and he might be allowed to speak with them by security. He does have a slight issue with being a younger body at the moment, but they can be resolved. Asgardians: He was their king. He is not banished, at least not to his knowledge, but he is not in favor. That being said, his sacrifices with the World-Eaters are remembered. Balder can count on some Asgardians as well. Tyr, Sif, Heimdall, Hermod, and the Warriors Three all remember Balder and would almost certainly come to his aid. Odin may or may not, but Frigga would do whatever was needed for her darling child. Mjolnir Wielders: Either the Odinson or the woman who is Thor would probably move a mountain or two if Balder needed their aid. Ditto Beta Ray Bill. Balder is basically a Disney princess. He has animal friends when he is at peace. Birds will perch on him to sing to him. When he means no harm, deer will frolic before him. Skunks will not spray, dogs and cats adore him. He cannot command them, but he never would. The Allspeak with Baldur allows him to understand in a very general sort of way what animals mean, but offers him no ability to control, command, or cajole creatures to do his bidding. They just like him and want to be around him, unless he is hunting, then they bugger off. Once he has established his credentials as Balder, what with the new face and all, Balder has an excellent reputation amongst the heroes of Earth. Yes, he has made mistakes, but never out of malice. He is a hero's hero, willing to aid in any good venture and quite willing to let other heroes have all the glory and accolades. Though not the equal of Odinson, the former Thor, Balder is a deadly opponent with sword. He is better than Sif, who cuts swathes of death through battlefields. Balder is a swordsman par excellence, and can best all but the most talented of foes with great ease. Only the most talented of Earth's heroes is his superior, even then, it is a near thing. Balder has bested his brother with or without Mjolnir on occasion. One should not pick a fight with Balder, as even if one is a hard man, Balder is as well. He has a varied skill set, being able to slog out a brutal battle like a tank or warship, trading heavy, hard blows, or a more agile, fast combat style. He prefers to take advantage of his superior speed in most fights, but his enhanced strength has only enhanced the elegant brutality of his fighting style. Body blocks, tackles, and flying kicks have been joined with off-hand blows, shield bashes and elbow strikes. Balder has even added the dreaded head but to his repertoire. Balder fights well, and honestly, most superhumans lack his skill. 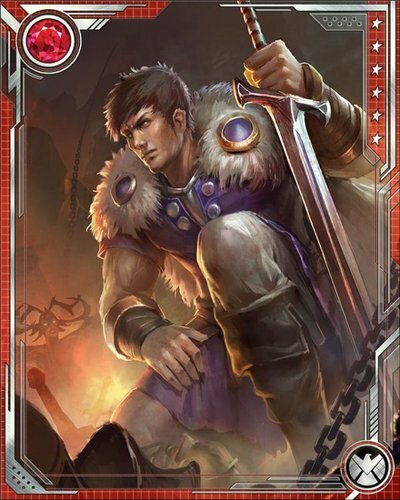 He is a superlative fighter, but his brawling style is built to supplement a melee weapon wielding fighting style. He is a little less adept at grappling than he should be, though he has a dreadful grip, and the agility and strength to avoid most grapples. Balder is an adept fighter, but it is not a martial art; it is improvisational and lacking in form. Balder had to learn to be a captain of soldiers the hard way. Always before, he has been able to fight as a champion, on his own with men and against foes. As king of Asgard, Balder leaned heavily on Tyr to accomplish military goals.Furthermore, the idea of war as glorious has all but left him. In fact, the idea of losing more lives paralyzed the young balder for a time. Balder has learned to spend lives, not waste them. He is a competent strategist, and a better tactician. He is also a far more able second and field command, executing another strategy than grand leader. Balder does not usually get unhorsed. He can handle almost any riding beast with great aplomb. Usually, if he loses a horse, it was hurt and brought out from under him by outside forces. He can ride other creatures as well, from the winged horses of the Valkyries, to large wolves, to a few more exotic alien mounts. Balder knows his Asgardian history, or at least as much as Odin will allow most anyone to know. He knows more of the Vanir half of his heritage now as well, due to his mother's teachings. Balder knows the history, politics, and the movers and shakers of the nine realms. Running, jumping, climbing trees, and breaking things are all things that Balder does with great aplomb. For a man of his size, he is very agile with a knowledge of acrobatics and gymnastics. He is athletic even by Asgardian standards which means he is very coordinated and capable. Despite the fact that he is all but immune to harm in his native dimension, Balder developed an athletic, agile style of combat. Balder, growing up, was the youngest brother. Thor and Loki would take care of the horses, get the fire going, and get camp running. Balder's job was to get the food made and the dishes done. When Sif was a long, Thor still made him do it, largely because she could not cook. One can only hope it has gotten better since then, yech. Regardless, Balder can cook. He got very fat at one point of his own cooking. The flipside to Thor and Loki doing that work, is Balder watched and learned from them. Loki might prefer civilization and its comforts, when they were boys though, Loki was actually a very clever camp mate to have. Balder learned from talented outdoorsmen, and applied those lessons. He lacks Thor's raw power, and Loki's cleverness, but he gets by just fine and can help a small party get along relatively well in the wilderness. Other than with swords, Balder is still a champion of Asgard and was trained to be competent not only with swords and his body, but almost everything in between. He is a decent archer, and with almost all hand to hand weapons, he is an impossibly skilled opponent. Balder is a skilled combatant, and can wield almost any weapon, even improvised ones to dramatic and potentially lethal effect. By most accounts, Balder is an able, capable regent with a really twisted and evil advisor he trusted far too much. Balder's reign was capable right up until it was not. In the past, he has stood in his father's stead in Asgard and to treat with foes. Always, he has been diplomatic and well-regarded. He is a capable diplomat, an acceptable governor, and an attentive counselor. He prefers to adventure, however. He will treat with honorable foes, and simply vanquish others. Balder is vulnerable to the plant mistletoe. A weapon or object constructed of the soft, pliable wood of the plant is destined to one day kill him, and might restart the cycle of Ragnarok. If a weapon made of mistletoe breaches his armor, it will regard his flesh as a human's rather than Asgardian's flesh. He will be injured, and quite likely die if it is placed in a vital area. It is important to note that the mere touch of mistletoe, standing under it for a kiss, or just a splinter will not kill him. One has to take this soft, pliant wood and kill him with it. It is possible, but no easy feat. On Earth it means nothing, other than Mistletoe penetrates his asgardian flesh when it probably should shatter against it. Balder, as much as he brings light and joy into the lives of others is subject to a brooding melancholy that he deflects with droll words and soft japes at those he loves and himself. He is not bitter, but he wears his figurative heart upon his sleeve. The world wounds him. Injustice, cruelty, the heavy handed greed of the ruler upon the ruled, it all bears on his mind. He does get over it, he does not sit alone in the dark writing poetry about he has wounds no elixir will heal, but he does feel things. Balder is a compassionate, fundamentally decent being. Balder believes in justice, integrity and duty. He balks at his past failures, and he loathes his own weakness. Foes take advantage of his mercy, integrity, and commitment to the underdog. He would rather save lives and inspire others to action than be the hero of song. He enjoy accolades, but only when they are deserved. Not the man, though should Balder see Doom again, it is almost certain that he will attempt to slay him. Rather, Balder's Doom. Baldur is doomed to die and restart Ragnarok. This time around, he has died twice, and no one has worried, but he knows in his heart that it is possible that should the cycle of Ragnaroks once again begins, Balder is fated to die, and when he dies the world will burn. He could go hide in a hole, but it would happen no matter what, at the appointed time. It does not get better. Once Ragnarok ends, he is fated to have to pick up the pieces and begin to work on fixing the Earth up, for it only to one days collapse in on itself again. Balder has no identity papers. He has bank deposit boxes and accounts on autodraft but he has no human identity. Balder was not reembodied as a human, he was found in the Destroyer Armor after Ragnarok. He would need someone to develop a human identity for him. Also, he does not look like the white-haired Balder who used to run around with the big muscle-bound blond guy who claimed to be Thor. Balder's immunity to damage other than from Mistletoe does not apply in any of the nine realms other than Asgard. Outside of Asgard, he is merely as invulnerable as an Asgardian of his physique. Very few believe he is the Balder of the myths. Sure, he has powers and all that, but he is believed to be at most an alien (partially correctly), and possibly a deranged powered individual. Furthermore, few believe him to to be the balder they know. He is younger, and he lacks the older man's brilliant white hair. He is, at best, the son of the other guy.